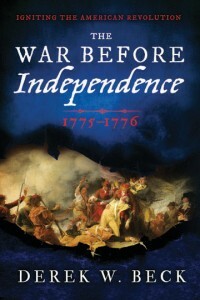 Continuing where his debut Igniting the Revolution: 1773–1775 left off, Derek W. Beck’s second nonfiction book begins with the new war just begun and the Siege of Boston underway, and quickly builds up to the exciting Battle of Bunker Hill. General George Washington arrives soon after and molds the new Continental Army. Meanwhile, to buy Washington time and prevent British reinforcement, Congress sends Gen. Richard Montgomery and Col. Benedict Arnold to Canada by separate routes as a pre-emptive strike against the other major British force in North America. Their expeditions converge and together they wage battle against the British in the epic blizzard Battle of Quebec City. 480p. Biblio. Notes. Index. Available in hardcover, audio, and ebook. Derek W. Beck’s first book follows the forgotten Dr. Joseph Warren through the beginning of the Revolution, from the Boston Tea Party and Paul Revere’s Ride to the daylong battle that ignited a Revolution. Available in hardcover, paperback, audio, and ebook. Book Cover and Pre-Order Available! Publication! Coming to a Book Store Near You!